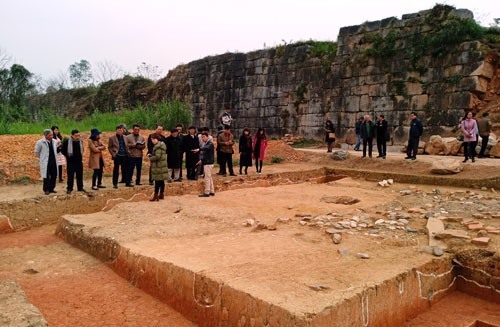 Scientists announced they have uncovered the structure of a wall at the 600-year-old royal Hồ citadel in the central province of Thanh Hóa’s Vĩnh Lộc District. After five months excavation on an area of 400sq.m, on a 20-metre section of citadel wall in the northeast area of the citadel, scientists discovered the wall was made of soil in the middle while the outer layer was covered by big stones. Many of the stones weighed dozens of tonnes. The citadel structure consisted of 11 layers of soil and pebbles, which were carefully mixed, while the foundation of the citadel had seven layers of pebbles and red clay. The foundation of the structure measures 50m in width. Scientists have also found various bricks, tiles and white ceramic bowls dating back to the Trần (1225-1400), Hồ (1400-1407) and Early Lê (1428-1527) reigns. The soil and clay was collected in the process of digging water canals around the citadel, archaeologists guessed. Archaeologists confirmed the findings would be scientific evidence for preserving the citadel wall. Professor Tống Trung Tín, chairman of the Vietnam Archaeology Association said this was the first time archaeologists found concrete information about the structure and building techniques of the citadel. The Hồ Dynasty Citadel was Vietnam’s capital under the Hồ Dynasty (1400-1407). The dimensions of the citadel, which was built in 1397, are 870m by 883m. It is the only citadel in the country built entirely of stone that has remained nearly intact throughout the nation’s history. According to experts, the structure is an outstanding example of this style of construction for a Southeast Asian imperial city. It was recognised as a World Cultural Heritage site by UNESCO in 2011.